How do I spend my Flexi eGift Card? Can you post my eGift Card to me? What types of gift cards can I get? The store would not accept my eGift Card/Voucher, what can I do? The online shop would not accept my eGift Card/Voucher, what can I do? When does my Flexi eGift Card expire? How can I keep my Flexi eGift Card safe? Can I print my Flexi eGift Card? I wanted to use an eGift Card on my smartphone, but there is no mobile internet access in the store. What can I do? Is the full amount of my gift donated to charity if I choose a charity gift card? Can I get a receipt for taxation purposes for my charity donation? Click on "Choose how to spend" and choose your gift cards or vouchers. For smaller values, eg. $10, you may not get to split your card. For larger values such as $50 or $100, you can choose any combination of different gift cards up to the total available balance you have. Click on your choice, then follow the instructions. Unfortunately no, your eGift Card cannot be posted to you. Your eGift Card is stored and sent electronically via the internet. It's like a gift card that is sent to you by email. If you can access email and the internet, then you can use an eGift Card! There are 3 main types to choose from. How you use each will be clearly explained. This is just like a normal gift card you used before, but it's stored electronically. As soon as you choose this type of gift card, you can spend it immediately. You use it by showing the egift card to the cashier on your smartphone's screen, or by printing it out at home and taking it to the store. Some eGift Cards can also be used online, by entering the gift card code and PIN during the checkout process. Generally an eGift Card can be used across more than one transaction, until the full value has been used up. An eVoucher is also electronic and is available to spend immediately. The main difference with an eVoucher is that you must typically use the entire amount in one transaction. A charity egift card lets you donate your gift to charity. Select the charity you wish to donate to, and then press donate. The amount shown will be donated to that charity on your behalf. Check the conditions and instructions shown. Note that some eGift Cards/Vouchers are only accepted online, while others are only accepted in-store and not online. Be sure to read these conditions carefully. Often the staff will not know about "GiftPay" or "Flexi eGift Cards". Remember, after you have chosen, the card/voucher you have was issued by that store. For example, if you have a Myer eGift Card, don't try to ask the Myer staff about GiftPay. Just say you have a Myer eGift Card to use. Try contacting the retail store's customer service or head office and explain the situation. If you still have no luck, please contact us and we'll try to help you resolve the issue. Check that your eGift Card or Voucher is designed to work online. Some retailers that have both physical stores and online shopping will only accept the eGift Card in store, not online. These conditions will be clearly displayed on your eGift Card/Voucher. Make sure you are trying to enter your code into the "Gift Card" or "Gift Voucher" section. Many online shops also have a space to enter a "Discount Code" or "Promo Code" - your gift code will not work in this section. Instead you must look for the "Gift Card" or "Gift Voucher" option, and this is typically on the payment screen. Each online shop is different so it is worthwhile to check the website's Help pages or FAQ for info on how to redeem your gift code. If you are typing the voucher code one character at a time into the online shopping checkout page, there is a small chance of missing a character or getting a character wrong, such as mistaking the letter "O" for the number "0" etc. You can avoid this issue by using your computer's Copy and Paste functions. It's also possible to copy and paste on many smartphones and tablets. To learn more about how to use copy and paste, consult your device's help or search online for more information. Try contacting the online shop's customer service and explain the situation. Initially, your Flexi eGift Card will have a very long validity period, typically 3 years (although in some cases your particular eGift Card might have validity as short as 6 months). Check the expiry date shown on the main Flexi eGift Card page. When you choose an eGift Card or Voucher, it will have a shorter expiry date, typically within 3 - 6 months, and sometimes as short as 1 month. What this means is that the expiry date of your Flexi eGift Card can change depending on the selections you make. 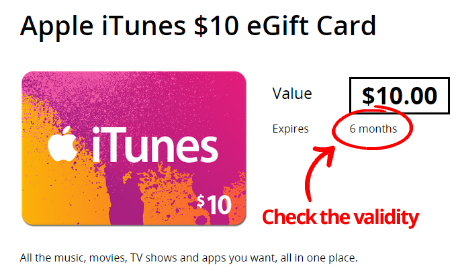 As an example, after selecting this iTunes eGift Card shown below, you would have 6 months to activate it before it expired, not the original 3 years of the Flexi eGift Card. For this reason it is very important to pay attention to the expiry and validity periods shown. Your Flexi eGift Card has a special web address (URL) that no one else knows. To keep your Flexi eGift Card safe, be sure to keep the web address a secret. Open your Flexi eGift Card on a private computer, for example where you are the only user, or you trust all other people who use that computer. Don't open your Flexi eGift Card on a public computer such as in a library or internet cafe. If you do, other people might be able to get access to your Flexi eGift Card by checking the browsing history. If your Flexi eGift Card was sent to you via email, keep the email safe. That email will ensure you always have access to your Flexi eGift Card. Don't print the email - we suggest you keep it electronically, in your email program or web mail. If you have a smartphone, open the email in your smartphone, open the gift, then bookmark the web page address of your Flexi eGift Card in your smartphone's browser. That way you'll always have it with you, ready to spend when you are out shopping. Yes you can, but you must make sure that you print the correct page. Don't print the Flexi eGift Card main page - it won't work when printed out like that. To use your Flexi eGift Card you must choose how to spend it first, and then print that chosen eGift Card or Voucher. Once you have chosen an eGift Card or Voucher and have activated it by clicking on the activation panel to reveal the gift codes, you can then print that page, ready to use in-store. Look for the Print button in the top right corner. In this case we suggest you go outside of the store where you have mobile internet access and open up the eGift Card with the codes or barcodes in your browser while outside. Then keep the browser open as you walk into the store to make your purchase and show the cashier your eGift Card. There are small transaction charges associated with processing charity gift cards. These are deducted and the balance is donated directly to the charity. Typically these charges are less than 3%. We consolidate and pay all user's donations to each charity in one donation each quarter. For this reason, the charity cannot issue each individual gift card donor with a tax receipt. To do so would result in more administration costs and less of your gift value being used directly for charitable work.